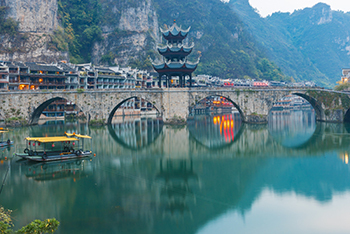 The history of Zhenyuan Ancient Town stretches back over 2,000 years. It is located on the eastern edge of the Yunnan-Guizhou plateau and is sheltered in the lush, green mountains of Guizhou. Zhenyuan was instated as a county in 202 B.C. by Emperor Gaozu and has remained an important part of Guizhou’s history ever since. However, as a tourist attraction, it has yet to receive the accolades that it deserves. It is a melting pot of Dong, Miao and Han ethnicities, meaning its architecture exhibits features and styles from many different cultures. It is home to a stunning sequence of temples known as Qilong or Black Dragon Cave and boasts the finest section of the Wuyang River, yet few tourists outside of Guizhou visit Zhenyuan or even know of its existence. Zhenyuan is a pearl hidden within the mountains; an “Oriental Venice”. The town is relatively small and only covers approximately 3 square kilometres (about 1.2 square miles). It was once one of the major transport and trade hubs in Guizhou, as it was easily accessed via the Wuyang River. The river itself winds through the town and splits it in half, effectively dividing it into two parts. The south part of the town is called “Old Wei Town”, with “wei” meaning “fortification”, and the north part of the town is called “Old Fu Town”, with the “fu” meaning “government”. Zhenyuan is a water town, with many boats still traversing its water, and thus has earned the name the “Oriental Venice”. It is also one of the best places to celebrate the Dragon Boat Festival, which takes place on May 25th according to the Chinese lunar calendar. They hold a dragon boat race on the Wuyang River every year, where long, elaborately decorated dragon boats are paddled to the beat of a large drum and race one another down the crystal clear river. Black Dragon Cave’s name can be quite misleading, as it is not actually a cave at all. It is a complex of ancient temples that slowly climb their way up the side of Zhonghe Mountain, just to the east of Zhenyuan Ancient Town. The temple complex covers a monumental area of about 21,000 square metres (approximately 220,000 square feet). The temples were built during the Ming Dynasty (1368-1644) and have managed to outlast two wars without sustaining much damage. They have been renovated since, but still maintain a lot of their original features and character. The complex is made up of temples dedicated to Confucianism, Buddhism and Daoism and, since all of the buildings adhere to the architectural styles of their respective religions, the complex is a myriad of elaborate styles and designs that make it relatively unique amongst temples in China. The complex encompasses a few, particularly attractive sites such as Zhusheng Bridge, Zhongyuan Temple, Ziyang Shuyuan or the Academy of Classical Learning, the Longevity Palace, and Yuhuang Ge or the Jade Emperor Pavilion. The temple complex is said to appear like a beautiful stone garden clinging to the mountainside of Mount Zhonghe. The Wuyang River flows 95 kilometres (59 miles) through the Miaoling Mountains, all the way from Huangping to Zhenyuan, and eventually joins the Yuanjing River in Hunan province. Three distinct scenic spots in Zhenyuan, Shibing and Huangping counties, known as the National Wuyang Scenic Area, have become famous tourist attractions, of which the scenic area in Zhenyuan is considered to be the most beautiful. Visitors can either walk along the river or take a relaxing, scenic cruise. Traveling downstream, the towering peaks and glittering clear waters will undoubtedly make you feel at peace and provide the perfect opportunity for some nature photography. As you traverse the Wuyang River, you’ll come across various scenic spots that have been given fanciful names based on their appearance or on legends related to that spot. The Wuyang Three Gorges are the most magnificent section of this scenic area. This is a 35-kilometre waterway that is made up of the Dragon King Gorge, the East Gorge and the West Gorge. Amongst these three gorges you’ll find powerful waterfalls crashing into the river, mysterious caves, the gentle gurgling of springs and the jagged figures of rocks emerging from the karst mountainsides. It is truly breath-taking to witness and we strongly recommend you take advantage of one of the local cruises in order to make the most of this scenic spot. It is said to be as spectacular as the Yangtze River Three Gorges and as mystical as the Li River in Guilin. On top of Black Dragon Cave and Wuyang Scenic Area, Zhenyuan is also home to an unlikely scenic spot of great historical significance. At the northwest edge of the town, you’ll find Shiping Mountain, which acts as the entrance to one of the southernmost sections of the Great Wall. Unlike the Badaling section of the Great Wall in Beijing, this 3-kilometre stretch of the Great Wall has not been renovated and is largely in ruins but is none-the-less beautiful. It was built during the late Southern Song Dynasty (1127-1279) and from its perch on Mount Shiping it provides a breath-taking view of the surrounding countryside. Compared to most small towns in Guizhou, Zhenyuan is relatively easy to get to. There are direct trains from Guiyang to Zhenyuan that take about 4 to 5 hours and from there the ancient part of the town is about a 10 minute drive from the train station. There are also regular trains from Kaili City to Zhenyuan, which only take about 2 hours, and also a few long haul buses from Kaili to Zhenyuan. Once you’re in Zhenyuan, there are plenty of guesthouses on the waterfront that are reasonably priced and offer a wonderful view of the Wuyang River.